Welcome to the Cobblestone Hotel & Suites in Pulaski, Wisconsin. Our beautiful hotel is conveniently located near everything that Pulaski, Wisconsin has to offer including The Green Bay Packers at Lambeau Field, Pulaski Polka Days, Carter Airport, Franciscan Monastery, Aurora Health Center, and more. Our hotel provides easy access for traveling to and from Highways 160 and 32. 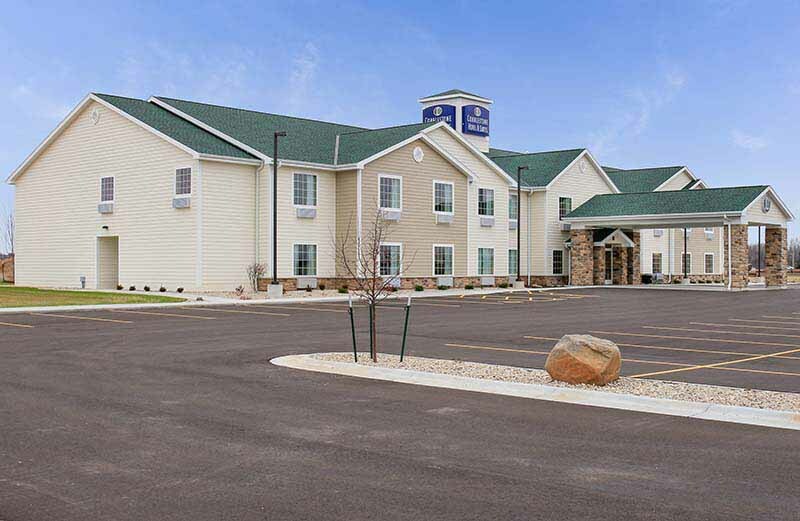 Located west of U.S. Highway 141, our hotel is within 20 miles of Green Bay, Wisconsin. In town for business? The Cobblestone Hotel & Suites of Pulaski, Wisconsin offers easy access to BelGioioso, MCL Industries, Przybylski Services, Anco Equipment, Furnitureland, L & N Metal Works, United Cooperative Pulaski, Nsight Telservices, Assumption BVM, Riesterer & Schnell, Bay Tek Games, Parker Freeze Dry, Marquis Yachts, Doc’s Harley-Davidson and much more! In town for some fun? Check out Pulaski Polka Days, Village Wide Rummage Sale, Skydiving, Mountain Bay Trail, Lambeau Field, Doc’s Classic Car & Cycle Museum, Doc’s Zoo, even cut your own family Christmas tree and more.